When I say “years,” I really do mean YEARS. I’d nearly given up on ever turning out a perfect pie, and then just last year it finally dawned on me. My mom’s recipe was written to produce two 9-inch pie crusts (or one double 9-inch crust). But I’ve always used my beloved Fiesta pie bakers — which are 10 3/8-inches deep dish bakers. Doh!!! I’d been rolling my crusts way too thin in an attempt to make them fit my extra large pie dish. Simple fix — I rewrote the recipe to double the amount of dough, and now all is well. Well, almost… Now, I often find myself with some excess crust trimmings, and I hate for the to go to waste. What To Do With Pie Scraps? My mom always formed her pie scraps back into one crust, brushed it with a little melted butter, sprinkled it with cinnamon and sugar, and then rolled it up like a strudel. But I saw another idea in the recent November issue of Martha Stewart Living magazine that involved using mason jar lids as mini pie tins to bake pie scraps up into mini quiche. I gave it a try on Thanksgiving morning, and it’s a totally brilliant idea! Just cut 4-inch rounds from the scraps and fit them into standard sized Mason jar lids. Line them with parchment paper and fill with dried beans to blind bake the crusts. I figured I could adapt the filling from my popular mini spinach quiche; however, I soon discovered that we were out of bacon. But I did have a package of NatureRaised Farms® ham on hand, and it was the perfect substitute. 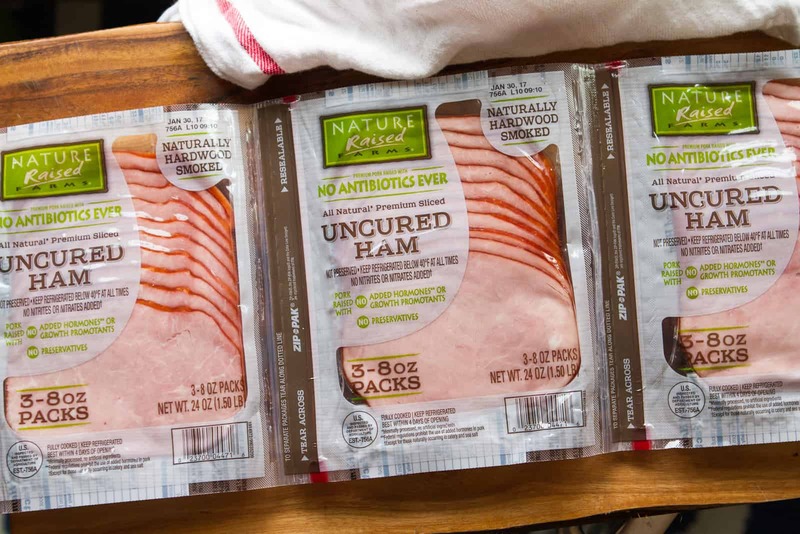 Just like the NatureRaised Farms bacon I shared recently, NatureRaised Farms ham is minimally processed and uncured. The ingredients list is only six items long: uncured ham, water, vinegar, turbinado can sugar, sea salt and celery. Find it in the refrigerated section at Sam’s Club. I sautéed the ham and a bit of onion in butter to really bring out their flavor. After blind baking the crusts, I filled each with about a tablespoon of the ham and onion mixture, and then topped that with a heaping tablespoon of shredded mozzarella cheese. Finally, I poured the quiche mixture (a simple combination of eggs and sour cream) over the top and baked the quiches for an additional 15 minutes. These yummy mini quiche didn’t even survive the cooling rack! It’s safe to say they were an absolute hit, and I have a feeling that next time I’m going to have to make a separate crust just for these. Of course, you could always just pick up a refrigerated pie crust at the grocery store. Why wait until you have pie scraps to give them a try?! 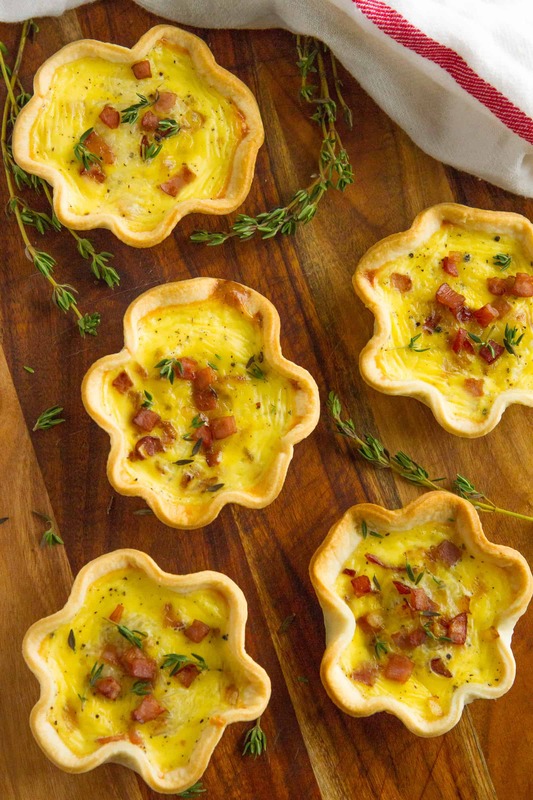 Pie scraps and mason jar lids turn out the cutest ham & cheese mini quiche you’ve ever seen… Did I mention they’re delicious, too?! Preheat the oven to 400 degrees F. Roll out the pie scraps to 1/8-inch thick on a lightly floured surface (or use a refrigerated crust). Cut out six 4-inch rounds. Place each round in a standard Mason jar lid (2 3/4-inch diameter), and slightly crimp the edges. 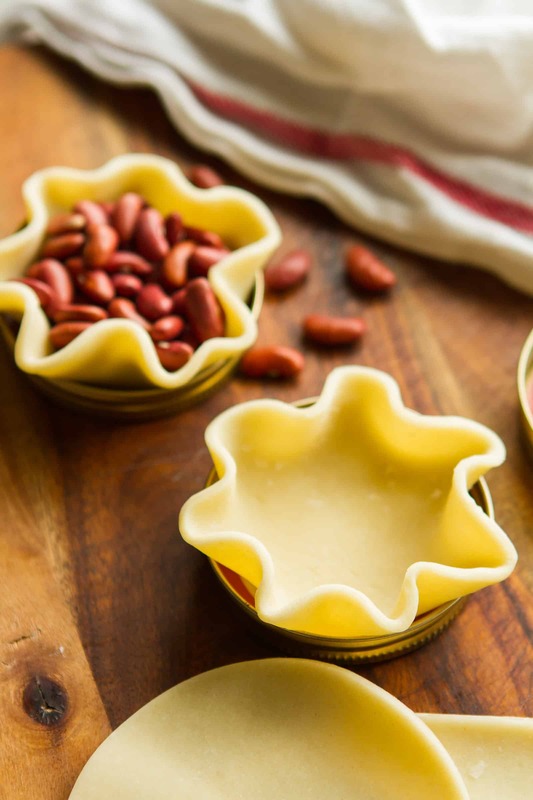 Line each round with parchment paper and fill with dried beans or pie weights. Bake at 450 degrees F until beginning to brown, about 12 minutes. Let cool while preparing the filling. Sautee the ham and onions in the butter over medium heat until the onions are translucent and the ham is browned. In a large measuring cup, whisk together the eggs, sour cream, nutmeg, salt and pepper. Divide the ham and onion mixture between the six crusts, about 1 tablespoon per crust. Top each with a heaping teaspoon of shredded mozzarella cheese. Divide the egg mixture evenly among each crust. Bake at 375 degrees F until just set, about 15 minutes. Cool before serving. 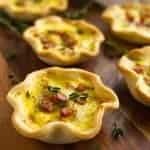 These ham & cheese mini quiche are excellent the next day, so if you want to make them ahead of time for a holiday brunch, go for it! 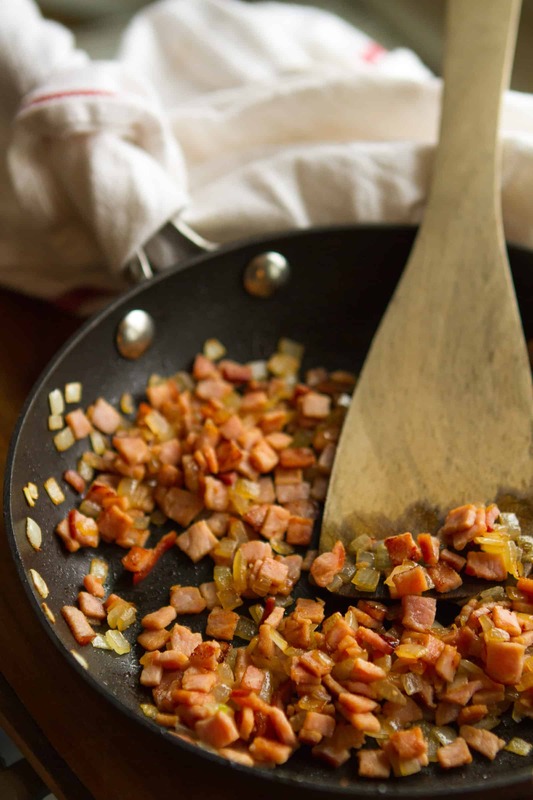 They’re also a fantastic way to use up leftover ham from Christmas, Easter, Sunday dinner, etc. Use this store locator to see if a Sam’s Club near you carries NatureRaised Farms bacon! Too many recipes in my head that call for bacon, but the one that stands out the most that my family loves, is my bacon and parmesan penne pasta. Never have leftovers when I make it! I would make a quiche with mushrooms, bell peppers, onions, cheese and bacon!! I would make a chicken and bacon homemade pizza!! I would make a ham and cheese hashbrown casserole. We are a pretty simple house. I think I would make some bacon cheeseburgers. Can’t go wrong with that! I like to eat bacon and egg sandwiches. Put some salsa on that and cheese and it’s good to go! I have a recipe where i soak bread crumbs in egg , some spices, cheddar cheese and lots of bacon. I let it soak for an hour or so and then I line a pan and I pour it in and I add more bacon and cheese and then i cook it. It is such and easy meal and it works great when you have bread that you need to get rid of. 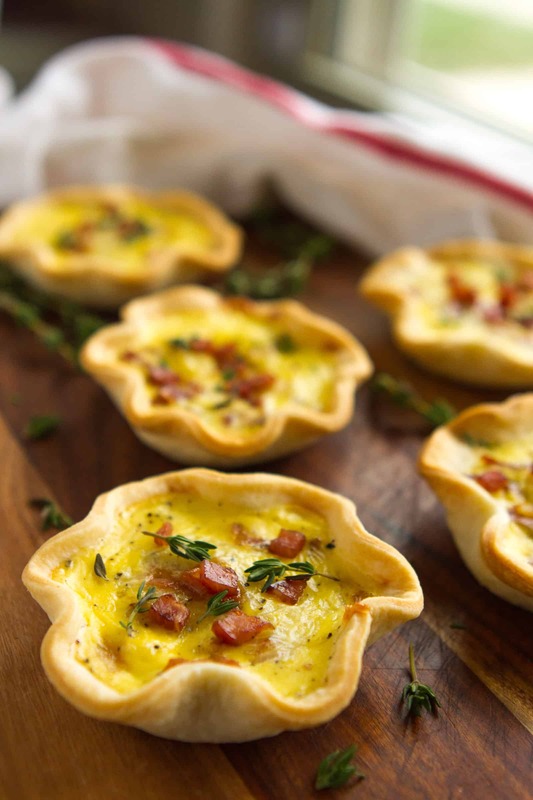 I absolute love Bacon Carbonara and that is what I love to make, only Tara’s little tarts are something that I definitely want to give a try! They sound delicious. I don’t think I have ever had eggs and sour cream mixed together. This has me intrigued! Oh I would make Bacon ‘n’ Egg Lasagna!!! I found a recipe online last year and we made it for the holidays for family…oh it was so good! We are doing it again this year! I would make bacon wrapped lil smokies covered in bbq sauce. Mmmmmm, bacon!! Everything is better with bacon! Especially bacon wrapped, cream cheese stuffed jalapeño poppers! So good! I will make ham and cheese hash brown casserole. I would make a cobb salad with bacon.